In the past two weeks, the Miami Heat have looked like the team that many have thought (and feared) they might become since LeBron James announced the intention to take his talents to South Beach. Miami has won each of its past seven games by double digits, and it has filled those wins with enough highlights to last an entire season. The Heat have been so dominant that after a Tuesday-night game in which they scored 120 points and won by 12, coach Erik Spoelstra felt the need to apologize for their performance. They have looked like nothing if not the best team in basketball, and for most of this run, maybe the best team in years. On Thursday night, still armed with two of the five best players in the world, that team is set to face the Knicks in the most anticipated game of this season. And somehow, among all the Linsanity, the Heat are an afterthought. While the sports media’s attention has skittered from the lockout to Chris Paul to Dwight Howard this year, the Heat have chugged along in relative anonymity. Compared to last season, when it seemed like Miami’s players and coaching staff spent as much time game-planning for press availabilities as they did for actual basketball games, the past three months must have felt like a pleasure cruise. From The Decision on, the Heat were the story last year, mostly by their own doing. 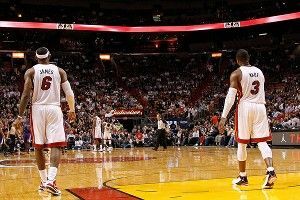 It began with Miami’s early-season struggles, Bumpgate, and the not-so-subtle frustrations with Spoelstra. It continued with the question of whether crying is allowed in basketball. It ended with the LeBron conversation, which has never really stopped. This season has been different. From the moment we learned the lockout was over, the Heat have managed to stay in the background. For most teams, the effects of the lockout (including injuries and how coaches have been forced to monitor minutes) have dealt with basketball. For Miami, its biggest effect has been how the labor dispute gave little time for preseason storylines. In the week after the lockout, most of the conversation was reserved for winners, losers, and what impact the new agreement might have on the league. Twelve days after it ended, news of the Chris Paul trade broke. What transpired with Paul, Los Angeles, and David Stern spawned weeks of material. One of the league’s best players changing homes is enough, but Stern’s decision was about that and more: the conflict of interest between the league and the Hornets, the Lakers’ championship window, the reversal of fortune for one of professional sports’ historically snakebit franchises. After Paul’s (immediate) future was set, attention turned to Dwight Howard. After the Lakers missed out on Paul, is Howard destined for Los Angeles? Does he want a trade? He does. But only to these teams. Oh, and this team. And no, not that team. The Howard drama continues, and at this point, it has started to feel like Orlando might be best served by making the league’s best center walk away from a pile of cash. The Thunder have no such concerns about the future of their stars — both Kevin Durant and Russell Westbrook have been locked up with lucrative extensions that should keep them in Oklahoma City for some time — but they are facing the same “chemistry” questions that Miami often dealt with last season. Oklahoma City has replaced the Heat as the excellent team with two superstars who, despite their talent, might struggle to “coexist” in the basketball sense. Did you see Durant glare at Westbrook? Are they really friends? Who takes the last shot?!? The Thunder have coexisted to a Western Conference-best 26-7. While the league’s current contenders are getting along well enough to be uninteresting, its past contenders are floundering enough to incite panic. Questions about the future of the Lakers began when Paul walked into the other locker room at Staples Center, and they have continued, loudly, into this week. Kobe Bryant hasn’t been shy about expressing his skepticism of the Lakers’ personnel plans, and now he says it’s time to either make or move or not. Bryant can do all the complaining he wants. Right now, no one is stealing headlines from the biggest story in the NBA. Jeremy Lin’s rise is fascinating, and his success has opened dialogue on topics that otherwise might go unexamined. Linsanity has become the only story imaginable that could overshadow LeBron James already laying the groundwork for his glorious return to the Cavaliers. Let’s look at that again. LeBron James, the best basketball player on the planet, said he would welcome a return to Cleveland, where he is the most hated man in town, and it stuck in the news cycle for one day. Blake Griffin overshadowing LeBron’s previous dunk of the season is one thing. This was LeBron and his clamoring for attention in all its glory, and it simply faded away. Knicks fans have been and should be thankful for Lin’s arrival, but Heat fans should be just as appreciative. Through 33 games of a 66-game season, the best team in the NBA is blowing everyone out and poising itself for a historic run of dominance, and somehow, they’ve done it quietly. It feels like that’s just the way they like it.